Property 6: Cottage with sunny wooden deck by water. Property 9: IPaD Sea Cottages "The Seaview getaway"
Property 24: Newly renovated house Stockholm & archipelago - 200 meters to lake. Markus gave us a lot of great tips based on our interesteds on what to do in the region upon our arrival. After settling in the house you can just relax and have a bright view on the sea and the huge cruise ships on it. You are getting addicted to this view, so please make sure to bring enough time to fully enjoy this lovely cottage! 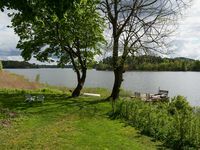 It doesnt matter if you just want to sit around or explore the surrounding, the location of the house gives you all possibilities (nature reservoir, Stockholm, Vaxh&ouml;lm, small lakes, hiking, driving around etc.) Highly recommendend... this place is a pearl!